Colour Sergeant Charles Bowden BEM Royal Marines was a notable member of the Royal Marines Band Service, not only appearing on film but also having started his career as a Royal Marines Cadet with the VCC in Portsmouth. Charles came from a family with a distinguished record of service in the Royal Marines, both grandfathers, his father and three uncles and a brother having served in the Corps. In 1923, at the age of seven, he joined the Royal Marines VCC at Eastney Barracks, Portsmouth, wearing the old Royal Marine Artillery cap badge, and eventually rising through the ranks to become the Cadet RSM. He joined the Royal Marines in 1940 and became a sergeant within three months. He soon found himself in the Near East with the 1st Mobile Naval Base Defence Organisation, and was involved in the Battle of Crete. Charles was taken prisoner by German parachutists but he escaped whilst in hospital in his pyjamas, boots and cap and rejoined his unit. He was involved in bitter fighting in a rear-guard action against heavy odds. When the day was lost, a party of 138 embarked in a damaged landing craft to make their escape. After nine days at sea on an almost non-existent diet of corned beef, biscuit and water, landfall was made in North Africa, near Sidi Barrani where Sgt Bowden carried out a recce, located a British unit and then led his companions to safety. His war service continued in the Mediterranean until late 1943, when he returned to Britain to train troops for D-Day, himself serving in France from July 1944. 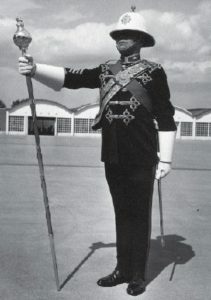 After Victory he served as a Military Training Instructor at the RM Depot, Deal, taking the King’s Squad to the Royal Tournament in 1947. 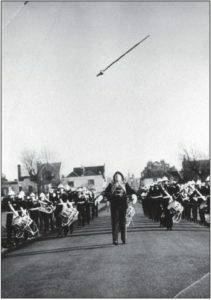 He became Drum Major in 1950. From then on he went from strength to strength leading the Staff Band at no less than twelve Royal Tournaments, five Beating Retreats on Horse Guards Parade, six Edinburgh Tattoos, and the 1953 Coronation of HM The Queen. He accompanied the Band’s visit to Vancouver in 1958, Toronto in 1959, to the United States and Canada in a long tour of 1965 and at the Sierra Leone Independence ceremony in 1961. CSgt Bowden was also the impressive and vocal figure at the start of the memorable RM Band rendition of the Thunderbirds theme, filmed at the Royal Marines School f Music in Deal. He also appeared in the film Oliver, showing his mace handling skills to their full during the ‘Who Will Buy’ scene. He was presented to the HM Queen Elizabeth The Queen Mother in 1956, awarded the British Empire Medal in 1957 and presented to HM The Queen at the 1971 Royal Tournament. Charles retired in 1972 and sadly died in 2011 aged 94 after a full and rewarding life.